Some changes to the search engine system were completed. A lot of it was backend, but it has repaired a lot of glaring bugs and issues that were found. There also was a high failure rate of searches not being completed because it's always an intensive process to do so. This update also tries to minimize those. For keyword searches, you can now easily switch between a display that shows topics or posts using a dropdown menu on the results page. Search queries have been given a slightly higher 'priority' to increase success rate. That's about it, let us know if you have any questions or problems. A number of features are finally announced as of today for the JFB service. Some of these were completed a few months ago, and many within the last week. Certain features had to be worked on live for both testing and development purposes. This announcement is intended to bring you up to date with anything you may have missed yourself. Take a look at all of the great improvements that have been added! This is a great upgrade to what we had before, largely thanks to posiden5665 for coding this one. All I did was integrate it. It corrects badly resized images, as well as lag issues with posting many images. The resizing is done client-side now. It does the same thing to attachments as well - the old IPB 1.3 code for resizing those has been replaced by this as well. Settings are in topics posts and polls in Admin CP. This feature is the answer to having to deal with name changes all the time manually. Instead of getting PMs, members can just use the User CP to put in a request that can be validated with a click of a button. 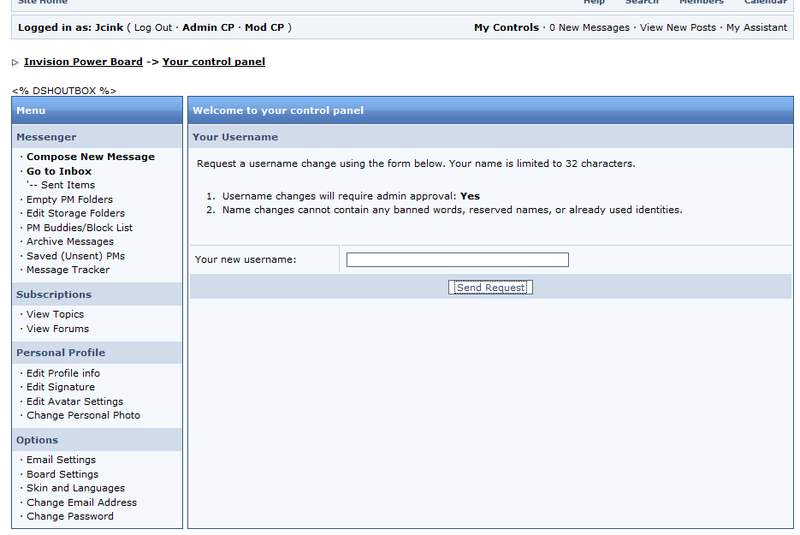 Allows members to put in a name change request that staff can approve/deny. Validation of new name requests is done via 'manage validating' of the Admin CP and the 'validating bin' of the Mod CP (if a super moderator). Skin dropdown in user cp and on index shows hidden skins if you're a board admin. You can now, if you use Unreal Portal option, choose to have a random poll display instead of a single one. Instead of having to check whether there's a new post or report to handle, you can just look right next to your Mod CP link. A number that combines queued posts + reports into one, and you can hover over to get stats. Once the tasks are completed by either you or ANY other moderator who has power to do them, it goes away. This will save time and effort of checking the Mod CP, or reading PM notifications about reports or queued posts. HTML is now allowed in IBStore item descriptions. A sample can be seen in our own shop where I've added a bit of bold to the change username item, as well as included a little image of money. You're not going to be able to do advanced things in it, but you can still use all sorts of short tags and CSS. Side note: while I was in the IBStore admin files, I cleaned up a lot of extremely bad spelling and grammar issues by the original programmer, and fixed a minor submit button bug that was on every page. They should be back for everyone now, on both D2 and regular style. If you have any staff colors or name effects, they'll appear right away. Additionally, a small bug regarding name changes not showing up on the global shoutboxes once executed was corrected in the process of doing this. For users of custom mini profile templates, the <!-- |age| --> variable will now call up a user's current age based on their birthday information if available. No need to add a profile field any longer. The ability to activation social networking buttons in topics is available. This will let your users easily share topics to a number of social media sites; thus increasing traffic to your board. In AdminCP > System Settings > Topics, Posts & Polls > Social Network Integration you can see a list of the most popular social networking sites to activate on your forums. Some are not relevant to every board, and others are more important, so you can pick and choose what you wish. The buttons will appear in every thread at the bottom of the last post in the corner. You may have noticed that there is no 'quote box' anymore when quoting a post. This was removed in favor of just placing the quote directly in the post itself. It makes things easier to see and edit when quoting a message. In an effort to combat spam signups, we've added a few layers of security in recent months. The old settings for proxy blocking have been removed that tended to produce false results, and there are now just two simple settings. We are now hooked up to the same database that stop forum spam uses; as well as a number of bot and infected proxy tracking systems. You don't need to do anything more than to simply enable it - but it's on for all forums by default. Search your PMs body/message area from within any folder. Great if you keep lots of old messages around and can't remember who said what. You can now quickly add games via a method called 'Arcade Queries.' What is an arcade query? It is a single block of text that contains game information that allows you to add games in one click. The games are generally pre-hosted and pre-prepared for you and there is nothing else for you to do. The wiki has been updated with information about this. We hope you enjoy all of the updates. Keep an eye out for further changes and new developments in the coming months.